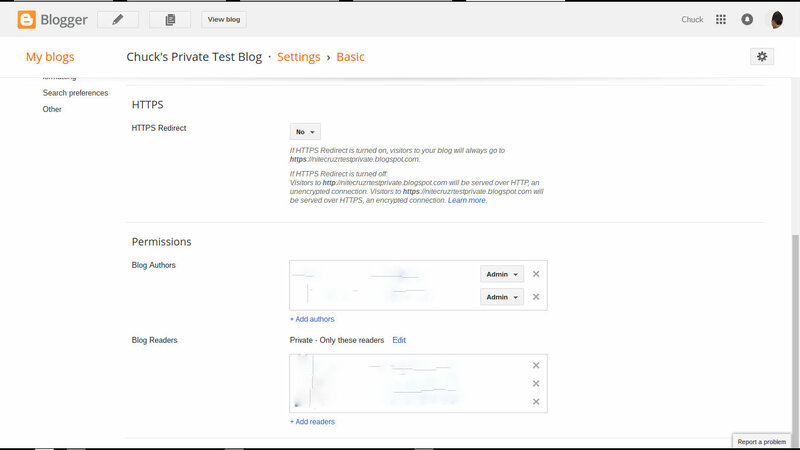 The Permissions wizard, on the dashboard Settings - Basic page, is how we setup both private and team blogs. You invite members - prospective authors and readers - using "Add authors" and "Add readers", respectively. Start from the dashboard Settings - Basic page, in both cases. Start from the Settings - Basic page. 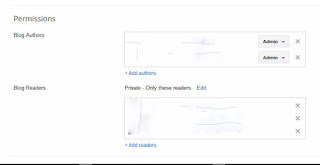 The "Add authors" link is used for adding both administrators and authors. Click on "Add authors", to add prospective administrators and authors. Click on "Add authors", and add prospective blog authors. Add a list of names / email addresses, with entries separated by commas. Paste or type email addresses of prospective administrators and authors, into the "Add authors" window. Or use "Choose from Contacts". The existing "Blog Authors" list is updated, and invitations are sent, when you hit "Save changes". To make an administrator, wait until the invited author has accepted membership. Then, change "Author" to "Admin", in "Blog Authors". Don't change an author to administrator, unless you understand the risks! The "Add readers" link is used for adding readers. Click on "Add readers", to add prospective readers. 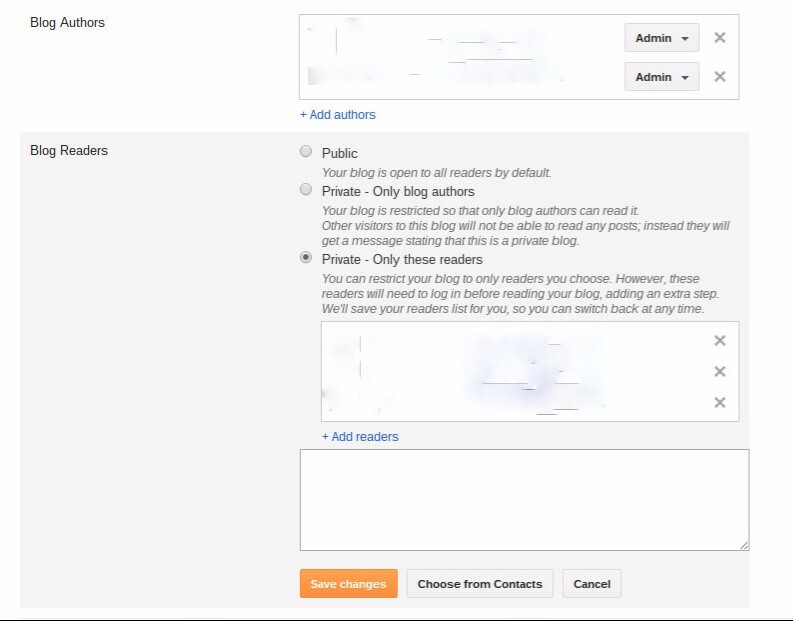 Click on "Add readers", and add prospective blog readers. 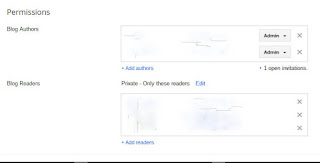 Paste or type email addresses of prospective readers, into the "Add readers" window. Or use "Choose from Contacts". The existing "Blog Readers" list is updated, and invitations are sent, when you hit "Save changes". 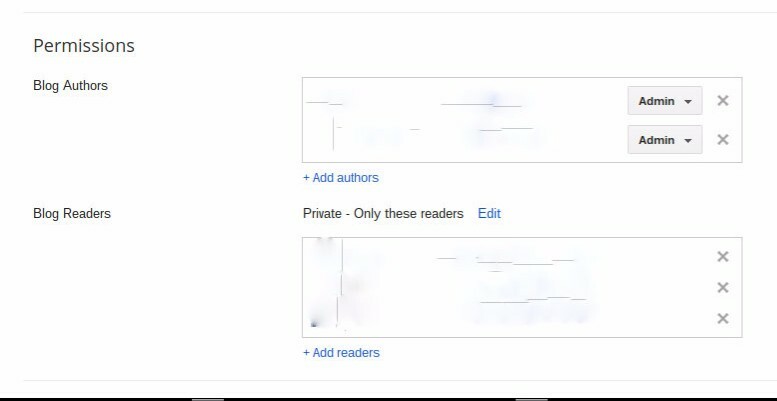 Select either "Only blog authors" or "Only these readers", for private blogs. 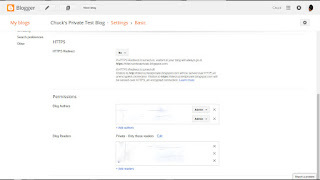 You can make a blog private to Authors - or have both Authors and Readers. 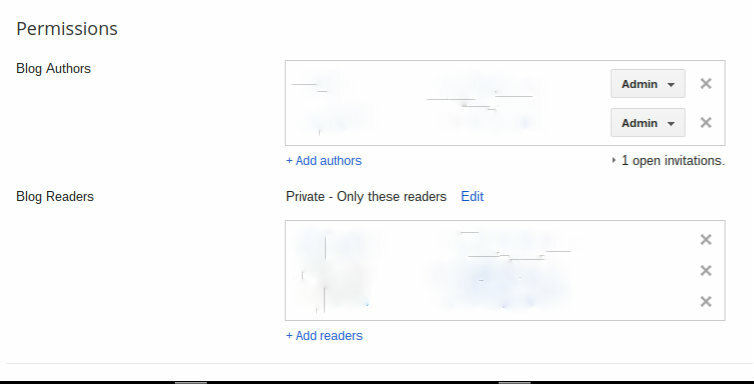 Select "Only blog authors" or "Only these readers", respectively. Each prospective member must accept membership. For an invited author or reader to become an active member, they must open the email and accept membership. Prospective authors and readers are listed as "open invitations" - under either the "Blog Authors" or "Blog Readers" window - until they accept the membership invitation. Accepting membership involves opening the emailed membership invitation, and clicking on the invitation link. The new member can use an existing Blogger account - or setup a new Blogger account, on the fly. A GMail account is not required - just a Blogger / Google account - existing or new. Whether you are making a private or a team blog, remember that every blog is limited to an absolute total of 100 members. Designated readers (in a private blog) are part of the 100 member limit. Un designated readers (in a public blog) are not part of the limit. A public blog can have any number of readers. Membership revocation may not be immediate. You can revoke or update membership of an administrator, author, and / or reader - but membership changes don't always take effect, immediately. 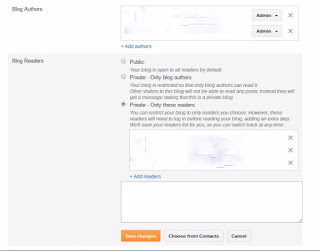 Making a #Blogger blog with administrators, authors, and / or readers starts with the Permissions wizard - and continues with each prospective member accepting membership, using email sent by the Permissions wizard. Absolute total of 100 members ... readers. This latter for private blogs, those public can, I presume have as many readers as they happen to get without these counting as members? Thanks for the question, this is a detail that I keep overlooking! Public blogs can have any number of readers!